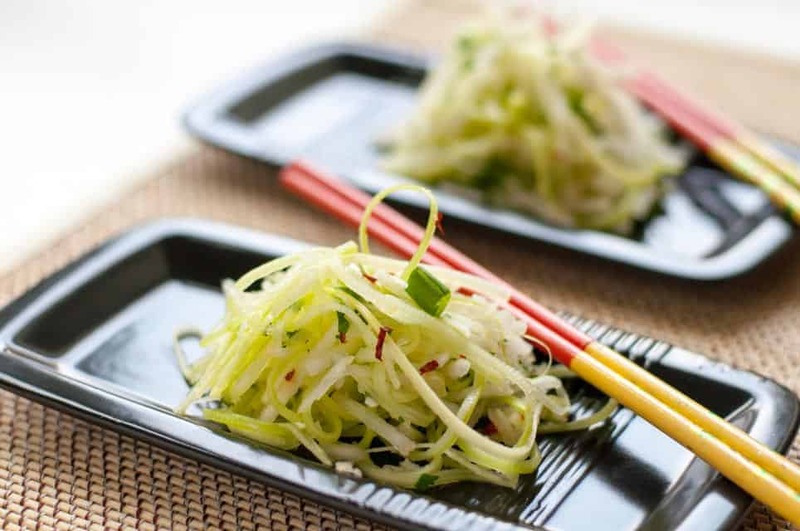 Sweet red onions and a flavourful Thai dressing turn plain cucumbers into something fancy. 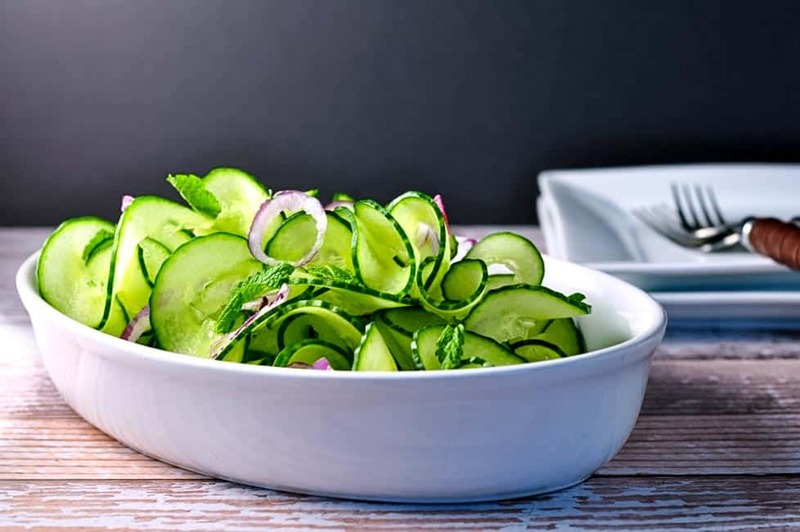 This Cucumber Mint Salad is ready in less than 10 minutes! 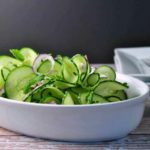 This Cucumber Mint Salad is quick and easy to make! 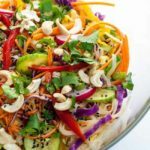 Toss thinly sliced cucumbers and sweet red onions with mint leaves and a spicy Asian dressing to make a side salad with a difference. Hands up if you’ve had quite enough of winter. I know I shouldn’t complain about the weather, living here on the West Coast. Watching the weather reports from Eastern Canada and the US about severe storms and heavy snowfalls has made me even more grateful that I live where I do. We have had no snow to speak of here this year, and it’s been mild and sunny lately. Daffodils are blooming and my peach tree has cute li’l pink buds all over it. But I’m longing for those summer days when I can pick fresh greens from the garden whenever I like, knowing that they’re organic and fresh and clean. Imported or hothouse greens are, well . . . fine, but I love the satisfaction I get from growing my own. If you have your own garden, you’ll know what I mean. Today I went out to the garden to check how it survived the winter, as mild as it was. My mint plant is sprouting like crazy! 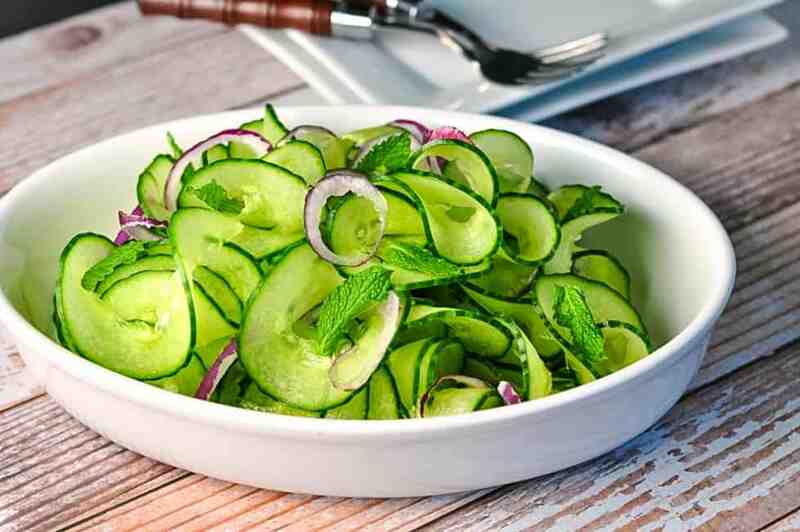 I decided to celebrate by making this fresh and crispy Cucumber Mint Salad. 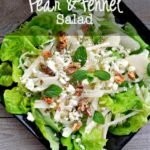 While I like winter salads with citrus or winter veggies, this one with fresh mint just screams, “Spring!” It’s cool, crunchy and refreshing. Adding sweet red onions and a flavourful Thai dressing turned plain cucumbers into something fancy-schmanzy, all in less than 10 minutes. or a very sharp knife would work well too. Spring is definitely around the corner. I sure hope we’ve seen the last of this winter, because Denis has already taken the snow tires off my car and put the summer tires back on. I’m thinking about hauling out that deck furniture soon . . . Mojito, anyone? 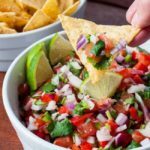 A quick and easy side salad. 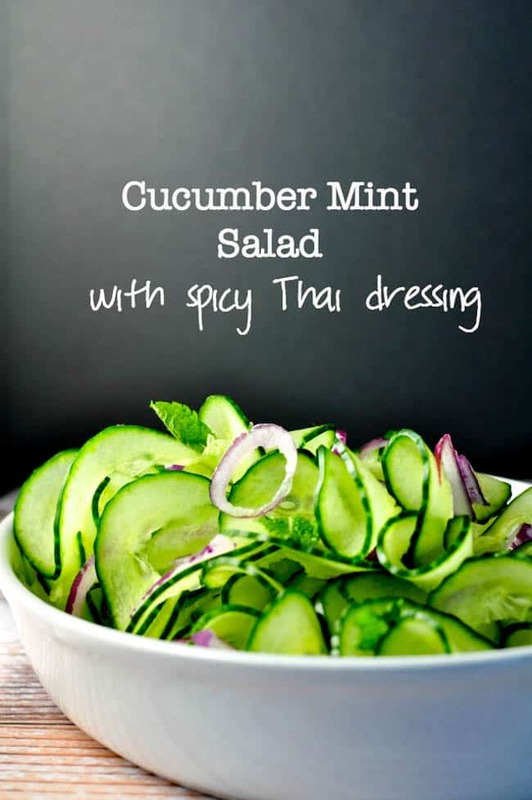 Thinly sliced cucumber and sweet red onions are tossed with mint leaves and a spicy Asian dressing. Place in a salad bowl with the mint leaves. Whisk together the dressing ingredients and toss together just before serving. This page contains affiliate links. Flavour & Savour is a participant in the Amazon Services LLC Associates Program, an affiliate advertising program designed to provide a means for sites to earn advertising fees by advertising and linking to amazon.com and amazon.ca. 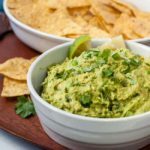 Funds earned simply helps me to offset the costs of operating this blog and sharing recipes with you, my followers. Thanks so much for your support! This looks wonderful! What brand of thai chili sauce do you use? Right now I’m using Thai Kitchen. those cucumbers look so pretty! makes me want a spiralizer! Yes Heather, the spiralizer is a lot of fun! Zucchini, apples, cucumbers, beets, even broccoli stalks–and lots more.